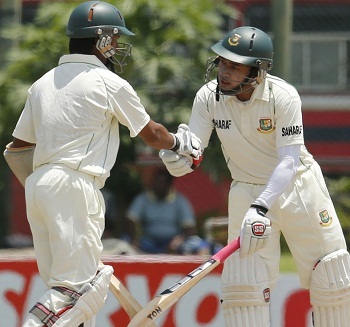 Bangladesh 4-438 (Mohammad Ashraful 189*, Mushfiqur Rahim 152*, Mominul Haque 55, Nowan Kulasekara 1-76) trails Sri Lanka 4-570 declared (Lahiru Thirimanne 155*, Kumar Sangakkara 142, Dinesh Chandimal 116*, Sohag Gazi 3-164) by 132 runs. Sri Lanka declared their first innings after amassing 570 runs for the loss of four wickets in 135 overs and Bangladesh replied strongly by scoring 438 runs with six wickets still in hand in 136 overs. The third day’s play finished on Sunday, March 10, 2013, at Galle International Stadium. Earlier, Bangladesh went into bat at 2-135 in 43 overs whereas Mohammad Ashraful and Mominul Haque were battling at 65 and 35 runs respectively. The batsmen started off from where they left last day as the debutant, Mominul Haque, dispatched his maiden fifty on the fourth ball of the 49th over with a four. Mohammad Ashraful kept on cruising from the other end as Mominul Haque became the first victim of the day for 55 off 83 balls with 9 fours. The third wicket fell at 170 and Mahmudullah was stumped smartly by the wicket keeper, Dinesh Chandimal off Rangana Herath for a duck seven runs later. Mushfiqur Rahim, the captain of Bangladesh, got together with Mohammad Ashraful and the pace of scoring was speeded up by the pair. Mushfiqur Rahim added 11 runs in the 59th over with a couple of fours and the second hundred of the innings appeared on board in the 61st over. Mohammad Ashraful plundered his sixth Test century on the second delivery of the 67th over with a four and made a great comeback in the longer version of the game. Lunch was taken after 73 overs as the Bengal Tigers reached 4-224 whereas Mohammad Ashraful and Mushfiqur Rahim were at the crease with 107 and 25 accordingly. Mushfiqur Rahim opted to play offensive cricket, he was getting boundaries regularly and Mohammad Ashraful kept on securing his end. The first achieved his 10th Test fifty in the 82nd over as the latter hit 3 fours in the 86th and next overs. The hundred runs partnership for the fifth wicket was posted on the fifth ball of the 88th over as the Islanders found it hard to separate the partnership. The association kept on strengthening and enhanced the score to 330 without any further loss in 106 overs whereas Mohammad Ashraful was in the center for 143 and Mushfiqur Rahim was supporting him well at 92 when the umpires decided for the tea break. Mohammad Ashraful scored his 150 runs in the 109th over and Mushfiqur Rahim blasted his second Test hundred on the fourth delivery of the next over with a four. The latter was dropped at 103 runs by Tillakaratne Dilshan off his own bowling and the batsman availed the chance by getting another four in the 116th over. The follow on was averted in the 121st over when the tourists went past the 370 runs mark with a six from Mushfiqur Rahim. The 200 runs partnership was witnessed in the next over and the fourth hundred of the innings was posted on board in the 127th over. The home bowlers looked helpless on the flat track and the two batsmen continued piling up the runs with the assistance of frequent boundaries. Mushfiqur Rahim scored 150 runs in the 133rd over as Mohammad Ashraful was just 14 runs away from his maiden Test double century. The Bengal Tigers hammered 438 runs for the loss of just four wickets in 136 overs whereas Mohammad Ashraful and Mushfiqur Rahim secured their ends with 189 and 152. Bangladesh is still 132 runs away from the first innings’ total of Sri Lanka but keeping in view the present form of the duo at the crease and some more batting to come, the visitors may take a lead as well.